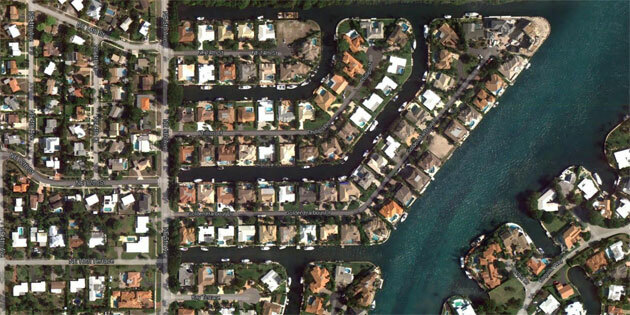 Golden Harbour is a quiet, waterfront community of luxury homes that are nestled along the deep water canals of the Intracoastal Waterway in East Boca Raton, FL. Known as a local "boater's paradise," Golden Harbour waterfront homes are situated on "No-Wake" zoned waterways with no fixed bridges, providing easy access to the Atlantic Ocean. Most of the homes for sale in the Golden Harbour community offer private deep water docks that can accommodate large vessels and are surrounded by lush tropical foliage and shimmering water views. Constructed in the 1960s, Golden Harbour originally consisted mostly of single-story "Old Florida," single-story homes. Though a few of the original "Old Florida" homes still exist today, most of the homes in Golden Harbour have been completely remodeled or replaced with impressive Mediterranean-inspired luxury estates. With access to the Intracoastal Waterway just steps from home, residents of Golden Harbour are able to easily enjoy many popular water-based outdoor activities such as yachting, boating, fishing, jet skiing, and paddle boarding. The community is also located just minutes away from Boca Raton's beautiful beaches, as well as many of the area's incredible natural parks. Golden Harbour is close to some of the area's best shopping, dining, and entertainment options, as well as many popular attractions such as Mizner Park, the Boca Raton Museum of Art, and downtown Boca Raton. Major area highways, including I-95, are just minutes away from the community, making it easy to travel to Fort Lauderdale, Miami, and West Palm Beach, as well as the nearby international airports. With a beautiful selection of luxury homes in a prime waterfront location that offers water access to the Atlantic Ocean and the convenience of being close to all that Boca Raton has to offer, Golden Harbour truly provides South Florida living at its absolute finest. If Golden Harbour sounds like the perfect community for your next home, you may also want to visit other waterfront communities in East Boca Raton, including Blue Inlet and Boca Harbour. If you would like to learn more about Golden Harbour or any of the other waterfront communities in Boca Raton, FL, please call us at 561-998-9015. You may also reach us by providing your contact information in the brief form below, and one of our Boca Raton real estate specialists will reach out to assist you. We at Champagne & Parisi Real Estate look forward to assisting you in making your dream of owning a Boca Raton waterfront home a reality.